76/13 ZO ČSOP Salamandr, Lesy České republiky, s. p., Povodí Odry, státní podnik, Agentura ochrany přírody a krajiny ČR, Plzeňský Prazdroj, a.s. The project is supported by the Ministry of the Environment of the Czech Republic as it shall bring enormous benefits as far as environmental protection is concerned, especially in terms of species diversity preservation. The fact is well reflected e.g. by the participation of the Nature Conservation Agency of the Czech Republic (AOPK CR) established as an expert authority by the Ministry of the Environment. • spreading of the project results and providing further information on Natura 2000 and environmental protection in general. 4) enhancement of the awareness of the Natura 2000 network and nature protection in general; spreading of the project results as well as of the know-how regarding the suppression of invasive species and subsequent revitalization of the affected habitats. The Morávka river begins in the northeast of the Moravian-Silesian Beskydy mountains springing from the side of the Sulov hill. From there it runs to the north and feeds the Morávka water dam, then it continues to the northeast, up to Frýdek-Místek, where it flows into the Ostravice. 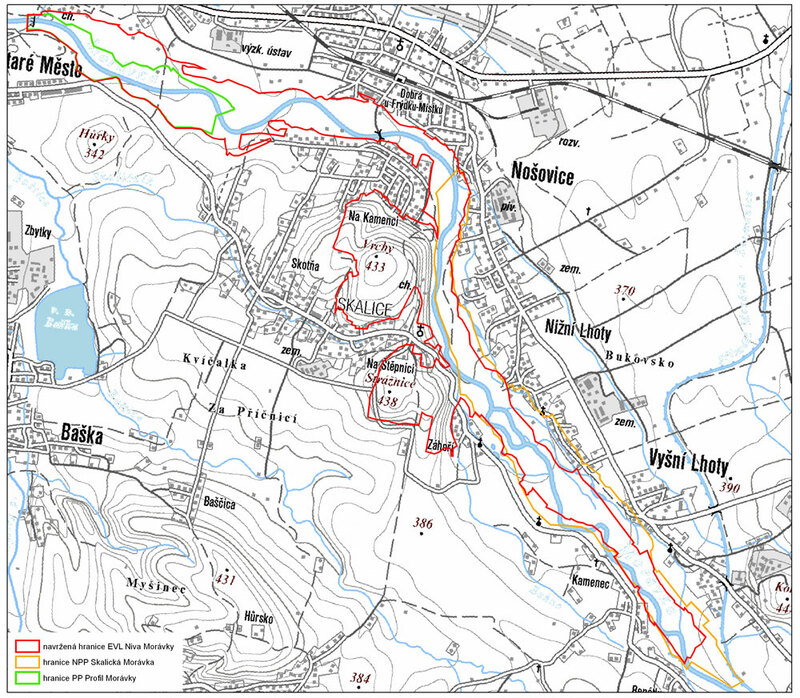 The Morávka river basin, the project site, covers two proposed Sites of Community Importance that are part of the Natura 2000 network – pSCI Niva Morávky and pSCI Beskydy. The area is situated in the northern part of the Moravian-Silesian Beskydy mountains in the Morávka alluvial plain between the villages of Nosovice and Nizni Lhoty. The average altitude of the area is 350 m above sea level. The project deals with the original, unmodified part of the wild and branching gravel-bearing river. The plain is characterised by gravel alluvia, willow-poplar forests, hardwood forests and Carpathian oak-hornbeam forests. One of the last habitats of critically threatened Myricaria germanica, as well as other species of threatened plants, occur in the area. The whole territory is very valuable both from biological and geomorphological points of view. From the regional, national and European points of view, it is most important to protect the site of the category, Alpine rivers and their ligneous vegetation with Myricaria germanica, as such habitats occur only in several sites in the Northern Moravia within the Czech Republic. The uniqueness of the site is illustrated by the fact that two especially protected territories were established therein. The natural monument of Skalická Morávka was designated on 1.1.2007, covering approximately 102 ha, so that the wild section of the Morávka flowing through the gravel alluvia is protected. It represents the last remaining virtually technically unmodelled water course flowing through gravel alluvia within the Czech Republic. The gravel alluvia are inhabited by many species that are very rare within CR; for some of them, the site is the last habitat. The natural monument of Profil Morávky covering almost 50 ha was designated in 1990. The area is very interesting from the geomorphological point of view, the river adopts a canyon-like character there, with many rock riffles and rapids. We can find many rare species of invertebrates in the site, as well as some threatened animals, such as the Eurasian minnow /Phoxinus phoxinus/ living in the river or the common sandpiper /Actitis hypoleucos/ nesting along the banks. The whole area of the pSCI Beskydy forms part of the protected landscape area (PLA) Beskydy. It is well-preserved countryside and landscape situated in the highest Carpathian hills within the Czech Republic. The forest vegetation is formed by beech forests with an abundant herbal layer and Carpathian oak-hornbeam forests. Acidophilus beech forests and ash-alder alluvial forests also occur there. Among grass-herbal communities, mesic Arrhenatherum meadows and Cynosurus pastures predominate. Cirsium meadows and Filipendula grasslands occur on wet sites. Besides, there are also broad-leaved dry grasslands with red cedar and orchids. Protected animals /e.g. Lutra lutra, Bombina variegata, etc./ live there, too. PREVIOUS EFFORTS TO ELIMINATE REYNOUTRIA SPP. In the past, Reynoutria spp. 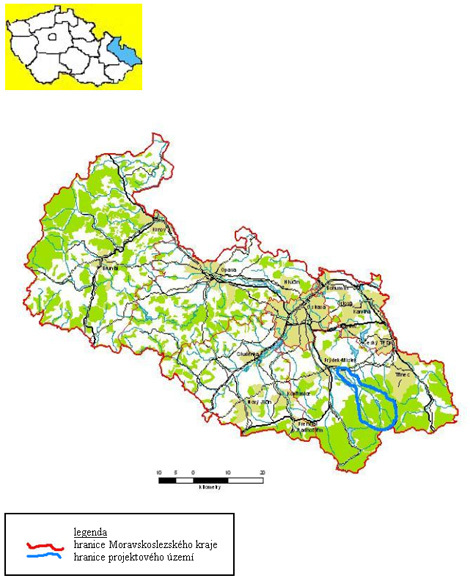 were eliminated in various areas in the Morávka river basin, most often along its upper part. In the first years after the elimination /usually performed by a single chemical treatment/, a significant reduction in Reynoutria was observed. Nevertheless, as the efforts to suppress did not continue in the years to follow, the invasion recurred. In some areas, though, Reynoutria was suppressed, and has been kept under control, its abundance being acceptable from the point of view of nature protection, until present days. Generally speaking, up to now the efforts to eliminate the species have not been successful, mainly due to lack of methodicalness, small area of treated territories, and short-term care of the treated areas. The whole river basin has never been treated which is the key precondition to successful suppression of the invasive plant taking the way of spreading of the species as well as the character of the river /especially regular spring floods/ into account. 1. Elimination of Reynoutria spp. The elimination of Reynoutria spp. shall be realized using two basic methods: chemical treatment with the herbicide Roundup Biaktiv and combined /mechanical and chemical/ treatment. Both methods are very efficient and sufficiently friendly to the surrounding biota. The first method will be applied to areas where the Reynoutria canopy is close to 100 % and there is virtually no risk of damaging other vegetation or endangering drinking water resources. The intervention will be performed by spraying 10% solution of Roundup Biaktiv by means of engine sprayers. The expected consumption of Roundup is 13 litres per hectare. During this type of intervention special attention will be paid to protection of biota occurring in areas adjoining the place of intervention. The second type of intervention will be applied to areas where Reynoutria canopy does not reach 100 %. With regard to herbal undergrowth injections of 15% solution of Roundup will be applied directly to the scapes. The expected consumption of Roundup is about 56 litres per hectare. All Reynoutria plants in the Morávka river basin will be treated. The interventions will be planned around the weather so that the biota, water or soil won’t be threatened due to rain, strong winds, etc. The treatment shall cover approximately 400 ha. We estimate that during the four years of project duration Reynoutria spp. will reduce to below 10 % of the current occurrence in all affected areas. The scapes which should dry within 2 to 3 weeks shall be cut with brush cutters and later either incinerated or transported to heating plants using biomass. The control and elimination of Reynoutria spp. after the end of the project shall be realized using the partners‘ own resources. Prompt restoration of the herb layer in areas where Reynoutria has been eliminated is necessary mainly in order to prevent the spread of other invasive species (e.g. Impatiens glandulifera, Solidago canadensis, Rudbeckia laciniata). Another reason is that the areas from which Reynoutria has been eliminated are susceptible to erosion. One of the most negative consequences of Reynoutria spreading is a gradual decrease in biodiversity in relation to bush layer reduction. Current occurrence of bushes is significantly reduced compared to the past both in terms of the overall quantity and the number of species. Negative consequences of this situation include, among others, greater susceptibility to erosion. Due to these reasons the planting of some species of bushes in selected areas is highly desirable, mainly in the proximity of water streams. That is why seedlings of Cornus sanguinea, Euonymus europaea, Ligustrum vulgare, Salix caprea a Salix purpurea shall be planted in selected areas. During the implementation of the project a research of the optimum method of invasive species elimination and subsequent revitalization of the habitats shall be carried out. The main aim of the research is to find the optimum method of Reynoutria elimination. It should be as gentle as possible as well as transferable not only within the Czech Republic but also across the EU. The optimum method of revitalization (plant sowing, bush planting, etc.) shall be studied, too. For the purpose of the research a number of test areas shall be established within the project site where the application of various herbicide concentrations and alternative methods of Reynoutria suppression shall be studied – e.g. injecting the herbicide into the plants‘ knots, application into cut scapes, digging up the roots, etc. In order to publicize the project and spread information about the Natura 2000 network information leaflets shall be prepared. They will be delivered to schools, distributed through municipal authorities or during the project events (seminars, conferences, educational visits), via the partners, etc. They will also be available for downloading in PDF format on the project web sites. An educational CD shall be produced with the maximum possible information about the project, problems related to invasive species, pSCI Niva Morávky, pSCI Beskydy and about the Natura 2000 network of protected areas in general. It shall be interactive, containing a great amount of expert texts and pictorial material. The visits shall be mainly intended for elementary schools and for technical colleges. Nevertheless, they will also be organized for other interest groups, such as members of municipal authorities or professional organizations and for the general public. Local inhabitants shall be invited to seminars where they will be given a brief introduction to the problems related to invasive plants, to the project itself and to the existence and nature of the Natura 2000 network. The necessity of intervention against Reynoutria will be explained to them. They will get information on how to proceed if Reynoutria occurs in their vicinity in future. Similar seminars with identical themes shall be held at local elementary and secondary schools. At each point of entry to the project site area information panels shall be installed. They will inform the public about the existence and nature of the project as well as highlight which area is currently under chemical treatment. 10. International conference “Invasive plant species"
The aim of the web sites shall be to inform the wide public and to spread the acquired experience as much as possible. The theme shall be invasive species, especially Reynoutria, with special focus on the progress of Reyonutria elimination in the project site of the Morávka river basin. The main aim of this action is to monitor how the application of Roundup Biaktiv influences sensitive and valuable plant and animal species. The monitoring shall focus on changes in the biota but soil and water burden shall be monitored, too. The monitoring shall be performed by independent experts, e.g. representatives of universities and/or research organisations. The conclusions of the monitoring as well as potential findings regarding environmental damage or damage to the biota shall be the basis for modifications of the method of Reynoutria elimination so that no damage may occur in the future. Water and soil samples shall be collected and analysed for the presence of harmful substances, especially for N-phosphonomethyl glycine and intermediate products of the process of decomposition. Water samples shall be collected in representative areas, i.e. from soil in territories having been treated with Roundup, from watercourses and still water in the project area, as well as from watercourses beyond its boundaries down the stream. Water and soil samples shall also be collected in territories outside the treated area so that the background pollution of the site can be evaluated. Water analyses will be performed in co-operation with the state enterprise administering the Odra river basin, Povodí Odry s.p., one of the project partners.